The 2019 annual meeting will take place on Thursday 11th April at 7.00pm in St Katharine’s Church. – 12 Parochial Church Council (PCC) members; there are currently two vacancies. – The serving Deanery Synod members have one more year of their term of office, and also serve as ex-officio members on the PCC. 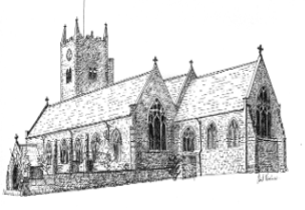 – And Sidespersons wanted – if you could spare an hour or so each month, or if you would like to know more, just have a word with Angela, or the churchwardens or any member of the PCC. PCC Membership – Could this be you? Being a representative on the PCC is open to everyone on the Electoral Roll. If you feel you have time to offer and would like to support St Katharine’s in this way, we are looking for parishioners with a fresh outlook who would enjoy being part of this area of parish life. Lists for the nomination of those willing to serve as Churchwardens, PCC members, and Sidespersons are on display in the Lower Room of St Katharine’s Church. Please put your name on the list if you wish to be included. The Annual Report to be presented to the APCM is be available to parishioners. This contains reports on the church building, the PCC, youth, and policies, as well as the Financial Statement for the year. Please pick up a copy from church.